A "terms and conditions" hire agreement, suitable for B2B as well as B2C deals. Use to hire out wide variety of products including audio-visual or any other technical equipment. A thorough and complete contract to protect the owner in every way. This agreement is also known as "equipment rental agreement". These are the business terms and conditions for hiring out the audio visual equipment or any technical as well as semi technical products to businesses or consumers. 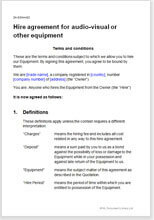 This agreement is drawn as a “terms and conditions” document which you will probably send out with a quotation or place on your counter, ready for a customer to sign. Use this template for a business model where the hirer signs in your shop or on delivery by you to his site. You can also adapt it for use on your website. Use for any hire period. Our use of plain English makes this document easy to edit to match your business model, without having to be your own an attorney.